Sunset Labradors is a small hobby breeding program. I share my home with my nine canine kids and their puppies. I do not have a kennel structure or scheduled business hours. Like most hobby breeders, I do not make a profit. My rewards come from the joy of raising carefully planned litters and providing approved homes with happy healthy puppies. Unlike commercial and backyard breeders that try to keep the cost of breeding and raising a litter to a minimum, dedicated hobby breeders focus on the betterment of our favorite breed. Responsible hobby breeders strive to preserve and improve the wonderful characteristics of their breed. Obtaining health clearances, researching pedigrees, evaluating the conformation and temperament of the parents, providing appropriate veterinary care, properly caring for the dam and her puppies, and providing a clean, safe and stimulating environment for the puppies are time consuming and expensive tasks. I am a member of the Labrador Retriever Club of Greater Boston. For many years, I was an active volunteer and a member of the board of directors of Labrador Retriever Rescue, Inc. As a member of LRCGB, I meet other Labrador lovers and learn from other breeders that share their knowledge and expertise. The club promotes ethical breeding practices and supports a range of activities including field trials, conformation shows, obedience trials, and Lab Rescue. The club also sponsors canine health clinics for eye and cardiac clearances. As a Lab Rescue volunteer and board member, I donated my time and talents to improving the organization, taking calls from people that needed to surrender their dog, fostering Labradors waiting for a new home, and approving potential families interested in adopting a Labrador. The focus of my breeding program is healthy, sound, intelligent Labradors with correct conformation, classic temperament, an eager to please attitude, and a low to moderate activity level. The selection of the stud dog is based on health clearances as well as the quality of the pedigree, conformation, and temperament. The stud dogs I select often have show titles and many of the dogs in their pedigrees are champions. The dogs in my line are the American show-type Labradors, aka English Labradors. Many of the dogs in their pedigrees are show quality, and a number of the them have show titles. The girls in my breeding program have had OFA hip, OFA elbow, OFA cardiac (by echocardiogram), and OFA eye testing done. They also have DNA testing done for PRA, EIC, CNM, DM, HNPK, RD/OSD, and D locus. My dogs are good retrievers, but they do not have formal field training. Rally obedience training, tossing balls in the yard, and dog walks are my favorite canine activities. Several of my dogs are show quality. In the past, I have shown my girls. My dogs and their puppies receive quality care with regards to safety, diet, exercise, veterinary care, and loving companionship. My canine kids live in the house and they have access to a large fenced-in yard via a dog door in the kitchen. Most of my breeding females have just two litters during their lifetime. My retired girls live out their natural life with me so you will be able to meet with the dam, the puppies, and several other older relatives. My puppies are raised in my home in separate indoor and outdoor areas. For the first month, the puppies are in whelping box in the guest room. At four weeks of age, I move my puppies into a spacious pen in my sunroom. 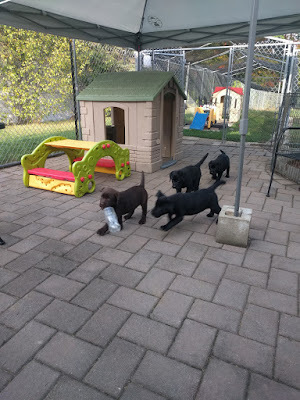 Weather permitting, the puppies play outside in a fenced-in patio area and a large grassy pen. They play in and around two toddler playhouses and several climbing toys. They are exposed to a variety of sights, sounds, and surfaces. My puppies have frequent visitors so they are well socialized. They receive the first vaccination against canine diseases and prophylactic treatment for parasites before they go to their new homes. My dogs and their puppies are fed Fromm dog food. My puppies are carefully placed in approved homes. My goal is to identify the puppy or puppies that will meets needs and expectations of their new owners. I encourage prospective owners to describe the traits they find desirable in Labradors and provide me with information about their lifestyle and family dynamics. There is usually some difference in the personality, activity level, confidence, sound and touch sensitivity of the puppies in the litter. I observe and evaluate them as they grow. My puppies are also temperament tested by an experienced dog trainer when they are at least 7 weeks old. Based on the results of the temperament tests and my observations, I will be able to identify the puppy or puppies that will be a good match for you and your family. The selection of a puppy to be placed in a home with young children, a time buyers, and a senior couple will receive careful consideration. There may not be a puppy in every litter that is suitable for these families. The goal of the sales agreement/contract is to protect the puppy and establish an understanding between the breeder and the buyer. The intent is to protect the interests of the breeder and the buyer, and to provide for the health, safety and well being of the puppy. The goal is to avoid misunderstandings and conflicts, and remain on friendly terms with the new owners. The agreement states my obligations to the new owners as well as the obligations of the owner to me and to the puppy. I retain an interest in all the dogs from my breeding program throughout the dog's life and I am available to help with problems or concerns. A detailed written health guarantee is included in the sales agreement. I stand behind my puppies with a new puppy or a partial refund if a problem develops. My responsibilities to the Sunset Labradors continues throughout the dog's lifetime. My sales agreement is posted in Nursery section. AKC limited registration will be issued with all the puppies sold as companions. The offspring of dogs with limited registration can not be registered with AKC. Dogs with limited registration can participate in numerous AKC activities including obedience, field trials, agility, and tracking. A spay/neuter agreement is included in the sales agreement. This is an important aspect of responsible dog ownership. Unplanned and unwanted litters are prevented. The risk of several serious health problems may be significantly reduced when the surgery is done post maturity. Based on recent studies, early spaying or neutering puppies may predispose them to various health risks including shortened lifespan, bone cancer, obesity, hypothyroidism, abnormal bone growth and development, CCL ruptures, hip dysplasia, and urinary incontinence in females. I will be available to answer questions as long as you own your Sunset Labrador. I have a lot of experience raising puppies and helping others solve problems with their puppies. I am happy to help new owners and I will continue to assist the owners of a Sunset lab with any problems and concerns throughout the dog's lifetime. I will provide references from people who have purchased a Sunset Labrador. Several families that own Sunset Labs are available to talk with prospective owners. I will also provide you with the names of my veterinarian and other Labrador breeders.